To restore Louisiana’s coast, we need a suite of large-scale restoration projects across the coast working together to deliver maximum benefits and reduce land loss, restore ecosystems and maintain habitat. In this”Restoration Project Highlights” series, we’ll be taking a deeper look at specific projects from our list of Priority Projects, highlighting why they’re needed and hearing local perspectives about their importance. Over the last several decades, and especially ramping up since the 2010 Deepwater Horizon oil disaster, barrier island restoration in Louisiana has been a central tool for protecting coastal wetlands — with over 45 miles of barrier islands being reconstructed since CPRA’s 2007 Coastal Master Plan. Barrier islands serve as the first line of defense in the “multiple lines of defense” paradigm of coastal restoration. By reducing wave action and storm surge, barrier islands protect the wetlands behind them, which in turn protects coastal forests, ridges, levees, roads and human communities. What is the Caillou Lake Headlands project? The most recent barrier island restoration project to be completed is Caillou Lake Headlands (a leftover name from when it was once, in fact, a headland connected to the mainland), also known as Whiskey Island. A headland is a piece of land once connected to a mainland to make up a coastline that projects out into the sea. This 5-mile island, along with Raccoon, Trinity and Wine islands, make up the Isles Dernieres barrier island chain located in the middle of Terrebonne Bay. A depiction of Isles Dernieres Barrier Island in 1853 and the chain of islands that now make up Isles Dernieres in 1988 after they detached from the mainland (Credit: CPRA). At a cost of approximately $118 million, funded through the Deepwater Horizon oil spill settlement, contractors pumped about 11.8 million cubic yards of sediment (enough sand to fill the Superdome three times) from Ship Shoal, a remnant barrier island on the floor of the Gulf of Mexico, onto Caillou Lake Headlands to create 1,000 acres. This project now stands as the largest restoration project ever completed in Louisiana, surpassing the Caminada Headland project completed in 2017. This restoration project builds upon a string of barrier island projects in the region, protecting vast coastal wetlands in the Terrebonne and Lafourche parishes. Why do Louisiana and nearby communities need Caillou Lake Headlands? Terrebonne Parish residents have been staunch advocates for the Caillou Lake Headlands project because the island, along with other barrier islands, is recognized as a first line of defense that protects wetlands and inland communities from storms and flooding. They understand the benefits that barrier islands provide, as these islands also curb saltwater intrusion from the Gulf into intermediate and brackish marshes, thus benefiting the seafood industry in the area. The completion of Caillou Lake Headlands is an important milestone in Louisiana’s barrier island restoration program and, indeed, Louisiana’s coastal restoration program more broadly, signaling an increasing sophistication in navigating the many challenges in designing and constructing large restoration projects. This lasting investment in our first line of defense will benefit birds and other wildlife for decades, as it simultaneously improves the health of the coastal estuary. How will this barrier island project benefit wildlife? Least Terns, like this juvenile, are attracted to beach renourishment projects where the increased elevation helps reduce the risk of storm surge (Photo: Melinda Averhart/Audubon Louisiana). Barrier islands are home to a unique suite of birds that depend on isolated islands on which to nest and raise their young. Although Caillou Lake Headlands does have a few mammalian predators, most notably coyotes, its isolation from the mainland still ensures a relatively safe place for nesting seabirds and shorebirds. The restored Caillou Lake Headlands are predicted to provide a late-season nesting home for Least Terns displaced from other places, either by storm surge (even one or two feet of surge can wipe out many nests), human disturbance or predator pressures. USGS ecologist, Rob Dobbs, provided evidence during a presentation at the 2018 State of the Coast Conference in early June that Least Terns are already aggressively colonizing the newly-completed restoration project. “Whiskey Island [also] provides overwintering and stopover habitat for Piping Plover, Red Knot, and many other species of shorebird,” says Rob Dobbs. He continues, “As one of several islands in the Isles Dernieres barrier island complex, Whiskey Island appears to support a relatively faithful core of Piping Plovers each year and, importantly, to host a broader, dynamic population of plovers as habitat availability in the complex waxes and wanes.” The key is creating habitats in different stages of ecological succession to ensure that each conservation priority species is benefited by coastal restoration. As the state restores islands, headlands and marshlands in sequence, these projects mature at different times providing this important habitat mosaic. Another important benefit of Caillou Lake Headlands is the nesting and foraging habitat it provides for Wilson’s Plovers— a conservation priority species with an extremely small population. “Whiskey Island provides important breeding habitat for 50-70 pairs of Wilson’s Plovers,” notes Rob Dobbs. 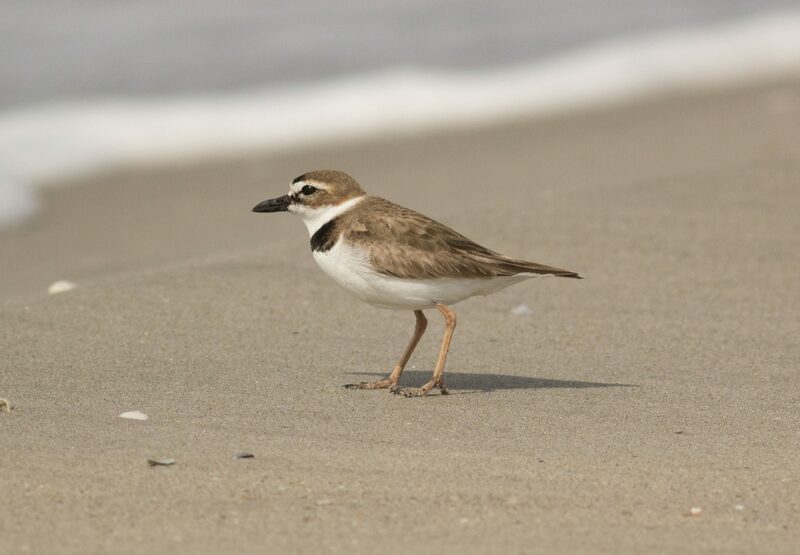 Rob and his colleague, Jessica Schulz, also discovered during their winter surveys a very special bird to me – a Wilson’s Plover yearling that Audubon’s coastal biologists banded 50 miles to the east on Elmer’s Island (where Caminada Headland Phase II completed in December 2016) in June 2017. 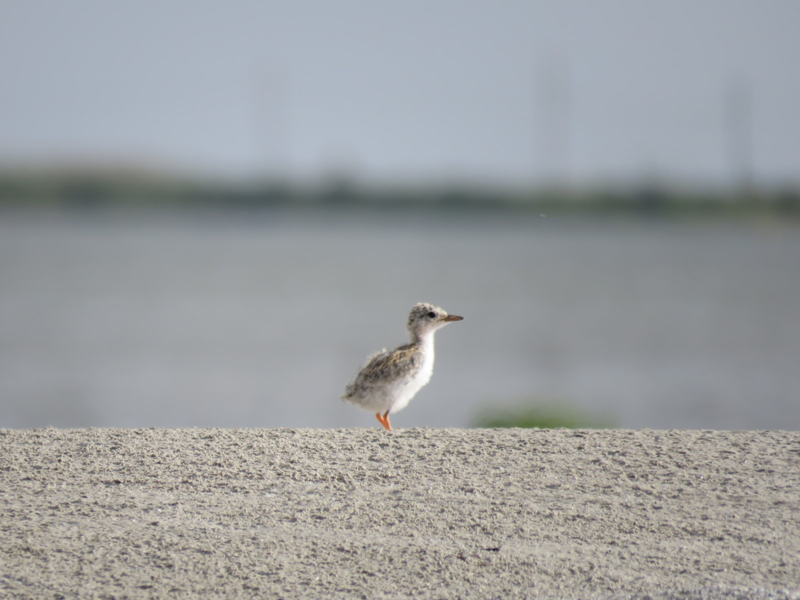 This bird, just a few days old and protected by the high dunes of Elmer’s Island, survived Tropical Storm Cindy, which washed away Wilson’s Plover chicks and nests elsewhere across the coast. This hardy survivor illustrates the importance of a functioning coastal ecosystem in which multiple restoration projects provide habitat during different life stages for not only birds, but all of our coastal wildlife and fisheries. Sign up here to stay updated on this project and to hear about opportunities to advocate for its completion.